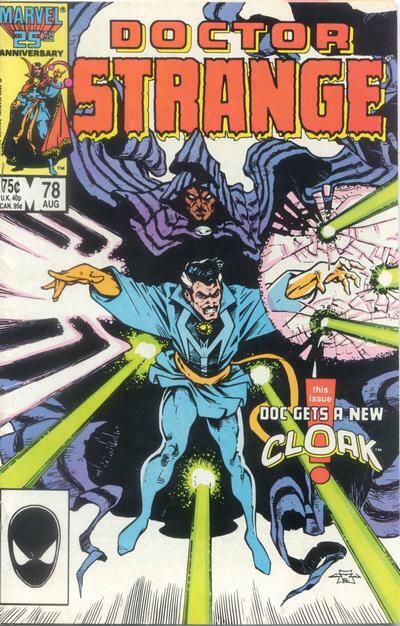 As per last issues rigamarole, Doc Strange needs himself a new cloak. Though he has no equal in the sorcerous realm, he can’t for the life of him figure out how to return his cloak to its former glory. He gets himself a spell going, though, but he finds that he’s not got nearly enough mojo for all that. Strange is trying to give Topaz the help she needs to find the missing part of her soul, but still keeping her at arm’s length. Topaz has quite the missing self-restraint, and he doesn’t know how to handle it. As they proceed through his inner sanctum she almost does something disastrous be looking behind a curtain. They then try another curtain which reveals a mirror showing…alas, they’re interrupted by some hubbub elsewhere! Turns out Strange’s cloak of levitation is pulling a Mary Poppins and throwing his entire study in array. Meanwhile, across the Atlantic, somebody dies from a new street drug. And speaking of cloaks, Cloak himself shows up, chasing shadows in an alley. Doctor Strange figures the whole re-weaving of his own cloak is for naught. He does some research and transports himself there using the Map of Light. He finds this diminutive humanoid dinosaur who has spent years making cloaks like those of Doctor Strange. While waiting for his cloak to be completed, he hears desperation behind curtains just like his back home. Cloak has confronted this drug dealer, but unwittingly played into her hands as she wraps herself in his cloak. Cloak himself is witnessing his worst nightmares, and this is what Doctor Strange hears from the portal. Doctor Strange does his due diligence in rescuing Cloak, though the villain isn’t necessarily foiled, and the issue ends in a very anti-climactic matter. The one thing I’m enjoying about these Doctor Strange comics is the existentialism of them. The X-titles were full of outside influences (not to mention gobs of characters) but these Doctor Strange issues are all about this introspective journey. Throw in tight pacing and great art propels the story up and out. Classic, just wish I had more than five issues.